CrowdSchool (CrowdSchool.co), an award winning education technology startup based in Los Angeles, announced the launch of the private beta version of its web platform to create, share, and discover project based learning lessons. With CrowdSchool, teachers can create a project based learning lesson in minutes. All CrowdSchool lessons are structured in the format of a “Challenge” for students to complete in class with internet connected devices. Bloomz is a new app, dedicated to helping teachers communicate, coordinate and connect with parents, by offering an easy way to message them, post class updates, and even create parent-teacher conferences in minutes, all in a private environment. Bloomz is now ready to roll out to schools everywhere, and the best part is, it’s free for teachers! We'll be offering a full review of Bloomz next month, so keep an eye for it here on the Roundup. Eduporium is a fairly new and unique educational technology start-up whose major mission is to deliver cool technology to the kids, parents and teachers of K-12 communities and unlock their masked EdTech potential. Eduporium partners with major corporations and small shops alike in an effort to improve access to the latest technology. Specifically, we search for and select cutting-edge tech to implement in schools, as well as supply and promote products that boost creativity in children and bolster the ever-important STEM/STEAM education. In addition to this special selection, our customer-focused eStore features thousands of easy-to-use and constructive technologies from apps that augment pre-school learning to Chromebooks that can modernize any classroom. SANTA MONICA, CALIF. (April 21, 2014) – Campus Steps, the platform that is transforming the way students manage their college futures, today announced that it has secured an additional $1 million towards its recently opened Series A, on top of closing its $2 million strategic investment led by Campus Explorer, a leader in college recruitment technology. Financing commitments have been made by OCA Ventures, Rincon Venture Partners and Vicente Capital, and the company expects to raise additional funding later this year. BYOD, 1:1 computing and other initiatives are driving schools to rethink how teaching and learning are facilitated. Additionally, K-12 schools are always looking to do more with less, as a result of stretched IT budgets. 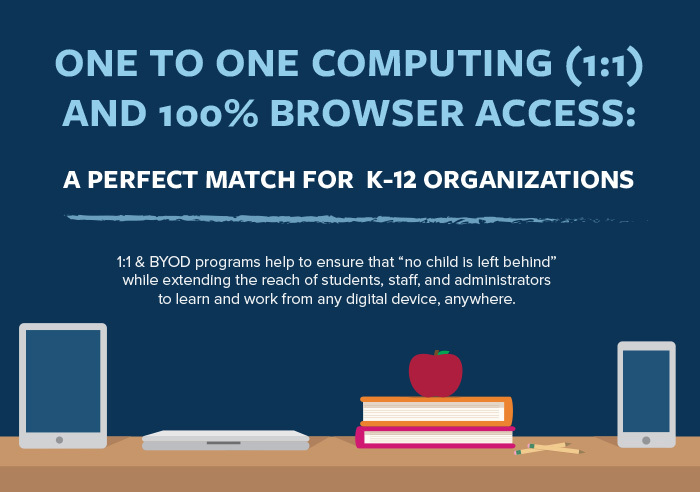 Integrating browser-based access powered by HTML technology offers an affordable solution that can open new opportunities for teachers, students, parents, IT and the school. Learn more here. The educational world generates millions of documents each year, from student assessments to lesson plans to research papers created by students or faculty. This information can be created in structured formats — as in student records — and unstructured formats, such as Word documents, email or presentations.